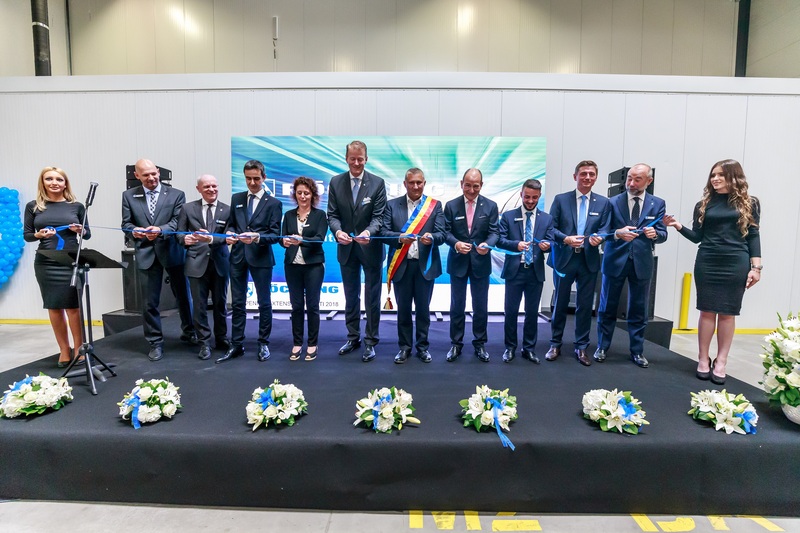 Mannheim, 19 June 2018 – During a large ceremony held on 19 June 2018, the management of Röchling Automotive celebrated the expansion of its production facility in Oarja/Piteşti, Romania, with the mayor and representatives of the local press. On an overall area of 16,100 square meters, Röchling Automotive has a total of 182 employees working on the production of its fuel-saving and emissions-reducing technologies such as the Active Grille Shutter system (AGS) and its SCR exhaust gas aftertreatment and filling systems. In addition, cowl grilles, compact and lightweight intake manifold and air filter systems from Röching Automotive as well as various housing elements and precision components from Röchling Precision Components are produced at the site. These are then delivered to global automotive manufacturers such as Volkswagen, Ford, Daimler and Renault/Dacia. With the expansion of its production facility, Röchling Automotive enlarges its product capacities and meets the increased demand for its innovative technologies. “Oarja/Piteşti is an important site for our growing worldwide business with new product innovations and technologies. In addition, we support our customers with local production,” says Erwin Doll, CEO, Röchling Automotive. “We are very happy to see the growing commitment of Röchling Automotive in our town. We wish the company and its production facility every success for the future too,” adds Constantin Bilea, mayor of Piteşti. The current expansion of the plant in Oarja/Piteşti by 7,500 square meters is the second expansion of the production facility built in the year 2011 – in 2014, the plant was enlarged by 1,600 square meters. Please go to www.roechling.com for more information on Röchling Automotive and its portfolio of innovative technologies such as the Active Grille Shutter system or the SCR exhaust gas aftertreatment systems. On 19 June 2018, the management of Röchling Automotive celebrated the expansion of the production facility in Oarja/Piteşti, Romania, with the mayor and representatives of the local press.